CT5100-1 is one of a number of coatings referred to as MCrAlY’s where “M” is typically Co, Ni, Fe, or a combination thereof. CT5100-1 is an alloy of Nickel, Chrome, Aluminum, and Yttrium “NiCrAlY” and is applied by the Plasma spray process. At elevated temperatures this coating forms a tenacious oxide layer that serves to protect the underlying substrate from oxidation and corrosion damage. 1) In the as sprayed condition, it provides a suitable surface for application various ceramic top coats. 2) It serves as an effective barrier against oxidation and corrosion of the underlying substrate material. 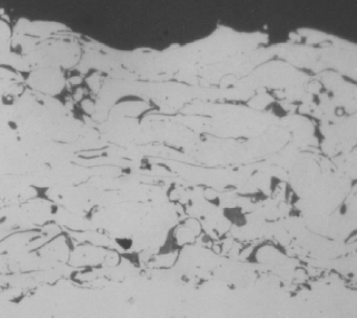 This coating is most commonly used on gas turbine engine hot section components (liners, caps, venturis, transition pieces, vanes, and blades). CT5100 is typically used as sprayed without further finishing.